Oops . . . that's Optimus Prime not Hoptimus Prime. The only transformation that will happen with this beer is if you drink too much . . . and that's not into a cool crime fighting robot but a drunken slurring lush. 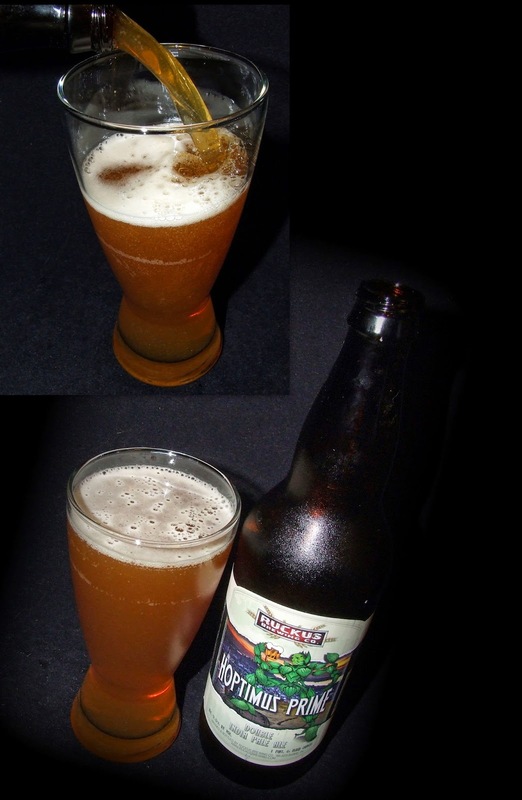 Hoptimus Prime (9% ABV) is a double IPA brewed by Ruckus Brewing. It pours a deep hazy orange with a thick but small head of foam. The aroma is mildy hoppy with fruity undertones. The tasty is malty with sweet fruits and barely any hoppy bitterness. The alcohol is pretty well concealed. The hops pull in towards the finish, which is clean and gently bitter. The mouthfeel is medium with lots of bubbles. When I pulled Hoptimus Prime from the fridge, I was craving a lot of hoppy bite. This doesn't have it. In fact, it's a pretty sweet brew for an IPA. Not a bad beer just not what I was looking for.